“I may be the first to say this, and I don’t know how this will make you all feel, but welcome to your last semester at Trinity College!” Students attending the Bantams & Beyond conference on January 18 responded to these opening remarks from Dean of Student Success and Career Development Jennifer Baszile with a collective groan. The truth is, thinking about post-graduation plans is anxiety-provoking. This is why I, and I’m assuming many of my peers, chose to attend this program for seniors—to put ourselves in the best possible position to have a smooth post-grad transition. 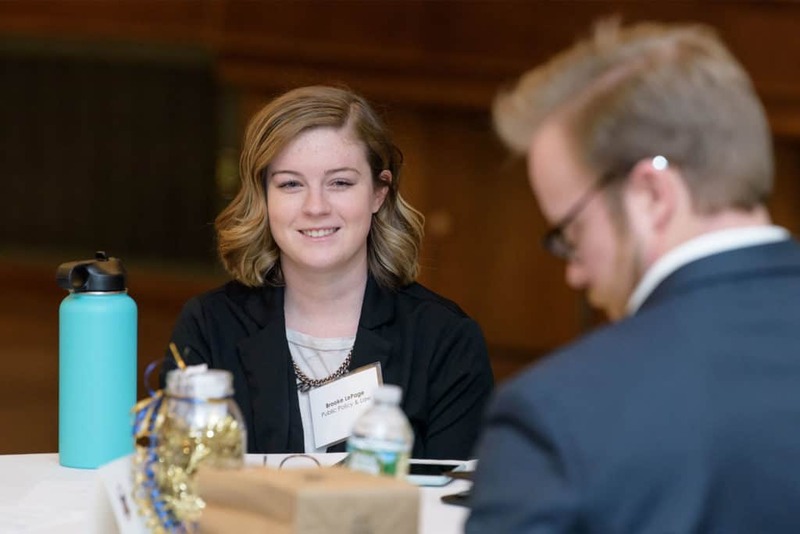 Brooke LePage ’19 talks with alumnus Duncan Grimm ’15 during the Bantams & Beyond program. Photos by Nick Caito. At Trinity, I am a public policy and law major with concentrations in education policy and law and society. This year, I am writing a senior honors thesis on Title IX and sexual assault on college campuses with the help of my adviser, Adrienne Fulco, director of the Public Policy and Law Program. Rather than pursuing a traditional study abroad program, during my junior year I did a Washington Semester Program through American University in D.C., where I took courses in American politics and political communication. I was also a higher education intern at the United States Department of Education in its Office of Legislation and Congressional Affairs. My goal for after graduation is to find a position that draws on the knowledge and skills I have learned from my courses and internships as well as my passions and interests. This leads me to pursue policy research, advocacy, or Capitol Hill positions related to education policy or women’s issues in Washington, D.C. My hope was that Bantams & Beyond would help push me just a little bit toward my goal or teach me how best to achieve it. 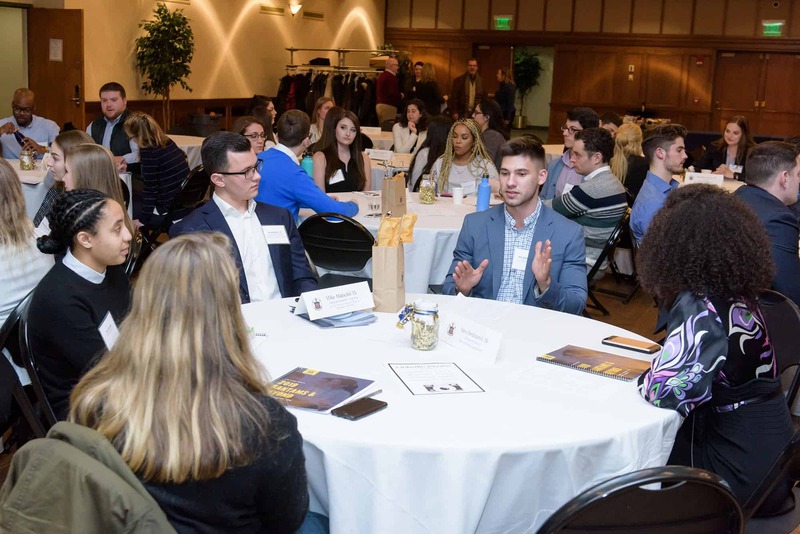 Trinity seniors had the chance to meet with alumni including Mike Mancini ’15 and Alex Bednarek ’18 during roundtable discussions and networking events as part of Bantams & Beyond. 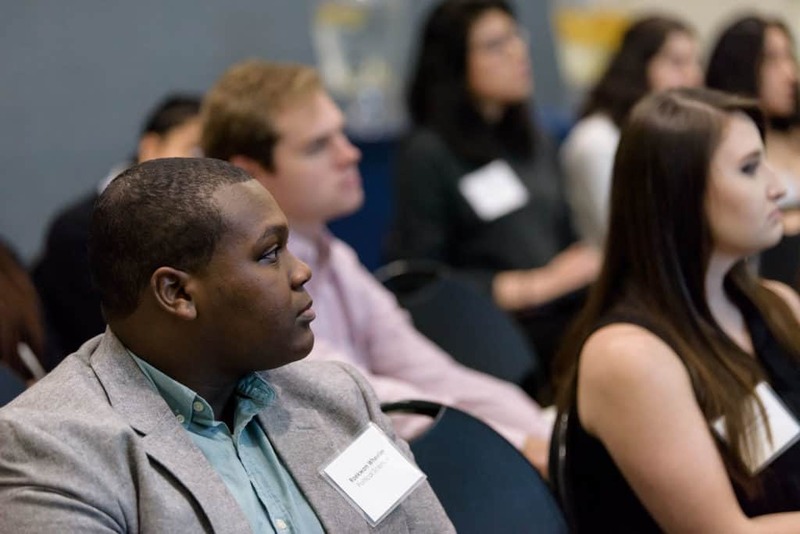 For this reason, I found the young alumni roundtable and alumni networking portions particularly useful. It is no secret that D.C. is a city that runs on networking. There were a few alumni at Bantams & Beyond who had spent time working in Washington or still do. They have held positions similar to the ones I am in the process of applying for and were able to give me the good and the bad, tell me things they wished they had known or things they wished they had done, and make recommendations on other positions to consider. The best part was that they all gave me their business cards and urged me to contact them. Students listen to Director of Career Development Joe Catrino’s seminar about salary negotiations at the Bantams & Beyond conference. The other part of Bantams & Beyond that I found particularly helpful was the salary negotiation seminar led by Joe Catrino, director of career development at Trinity. I have read about how women are less likely than men to advocate for themselves in work settings, including in salary negotiations. Additionally, I went in knowing that I am preparing to enter an extremely competitive and male-dominated industry. Because of this, I was happy to see that a lot of my intelligent, passionate female peers were equally as engrossed in the presentation. Joe explained that there is a lot of research that goes into having a well-informed and strategic salary negotiation. He also said that no matter the offer, his office should be our first stop after receiving it so that he can personally talk it through with us. I plan on doing just that. Many young alumni told us that they wished they had not panicked as much as they did about post-graduation during their senior year because it all works out in the end. Although this is comforting to hear, I also find that a lot of pizza and good friends can be helpful if things get rough. All in all, my peers and I went into Bantams & Beyond feeling a bit anxious for the future and left feeling a little more prepared and even a bit excited for what is to come. For more information about Bantams & Beyond, visit Trinity’s Center for Student Success and Career Development.